In a large bowl mix together the vegetable oil, ginger, soy sauce, sesame seed oil and rice vinegar. Toss the eggplant in the marinade. Heat the grill, and when hot, brush the grill with oil. 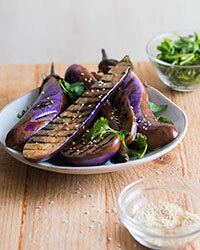 Place the eggplant directly on the grill, grilling both sides for 3-5 minutes each. After grilling brush the eggplant with additional marinade or soy sauce. Garnish with sesame seeds and cilantro.